60% of the time of the 2.2m telescope will be devoted to the study of supermassive black holes placed in active galaxies nuclei. Calar Alto Observatory, the biggest astronomical observatory within mainland Europe, has signed an agreement with the University of Peking in order to develop, from the 2.2m telescope, an intensive study of supermassive black holes located in the central regions of the galaxies, which constitutes what are known as active galaxies nuclei, and are among the most energetic objects in the Universe. The project, which will devote 60% of the telescope time and last until the end of 2019 (with a possible renewal until 2021), will position the observatory at the forefront of the study of active galaxies nuclei, and will contribute to provide budgetary stability to Calar Alto. “The University of Peking became interested in Calar Alto due to the quality of the sky and its projects”– Calar Alto Observatory’s Director, Jesús Aceituno, points out –. “Calar Alto has specialized during last decade in the development of big astronomical surveys, as CALIFA or ALHAMBRA, which are being fundamental for the modern astrophysics. Today we have enough experience for addressing this ambitious and long-term project that will help us to better understanding of these huge black holes together with their implications for cosmology”. Active galaxy nuclei (AGN) can emit in a continuous way more than a hundred times the energy of all stars at the Milky Way. Their structure consist in a black hole, up to thousand millions of solar masses, surrounded by a disc of gas which feeds it and that, in its process of falling, releases a lot of energy. 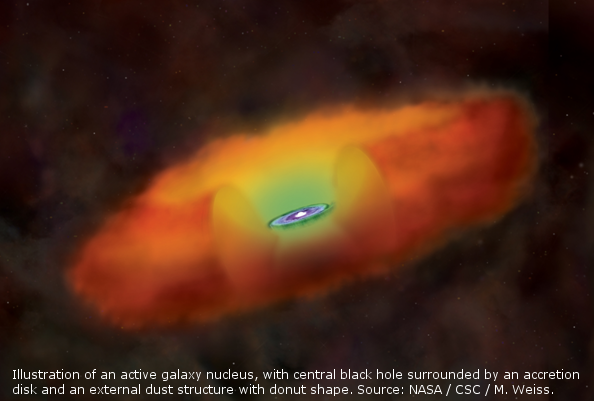 Although they have been known and studied for decades, active nuclei have numerous questions still unresolved, including the physical process of falling material into the black hole, or the relationship between its evolution and the one of its host galaxy. The project to be developed at Calar Alto will study a specific type of active nuclei ones that show a particularly high accretion rate, or disc material absorption. “We are using Calar Alto Observatory 2.2m telescope for developing an intensive study of a sample of about fifty supermassive black holes that will allow us to determine their fundamental properties, with their mass among them”, Jian-Min Wang, researcher from the Institute of High Energy Physics, Chinese Academy of Sciences and project head, points out.